Check the condition and connections of all cooling system hoses and heater hoses. Replace any swollen or deteriorated hoses. 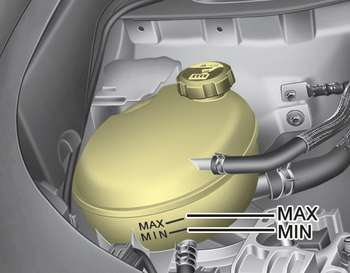 The coolant level should be filled between MAX and MIN marks on the side of the coolant reservoir when the engine is cool. If the coolant level is low, add enough specified coolant to provide protection against freezing and corrosion. Bring the level to MAX, but do not overfill. If frequent additions are required, we recommend that the system be inspected by an authorized Kia dealer.